Musical terms for the what? Sorry to say that this set of music worksheets is NOT about learning what the difference between Hip Hop and House, Drum n’ Bass and Techno is. The thing is.. that these things are still important! Italian is the Universal Language for Music – at least for musical terms that are written on scores. Its been that way for 300 years, and its unlikely to change. Even Percy Grainger couldn’t change it, and his use of English in his scores makes his music now look like something of an oddity. Nearly all music uses Italian terms in its scores – even pop music usually uses the convention of Italian names. It’s a fact that music students still have to learn the correct meaning of “Andante”, “Allegro” and “Presto”- or they will end up looking very silly – especially if they are going to take examinations in music. 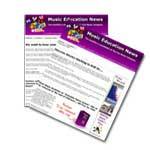 Helping students to know their terms well is really vital for all types of music teachers, both private music teachers who are preparing students for practical and theory exams, as well as classroom teachers that are responsible for making sure that students meet national standards in their respective countries. Why the Digital Age then? Because at the Fun Music Company we really wanted to find something different, something that would really enable the students to be able to do these on their own, rather than just having to “know” the answer. Students in the digital age are different – information is much more readily available at the touch of a button, and its much more difficult to get students to learn things by rote as once they were able to. Students don’t like to learn by rote – as educators we need to find ways to make even the most boring and repetitive of subjects into challenges for their mental abilities. We struggled with this for ages because the fact is that learning what “Andante” means can never really be that interesting! 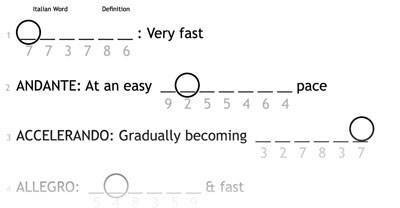 It is always a challenge to make stuff interesting for students as they really don’t embrace an old fashioned way of making them write it out 10 times very well. I know… I’ve tried teaching theory, and I found this was one of the hardest parts to get the students to do well in. But the problem with that is that the students really have to know the answers… or be able to look them up in a Dictionary. Was possible to find the answer without actually knowing it in the first place. 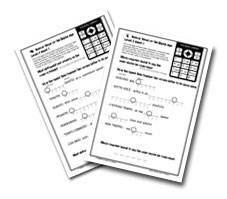 This meant that students could do the worksheet by themselves… without having to look it up or know the answer. Had an activity that was relevant to TODAYS students.. most of the activities in current theory books could have come straight out of the 60’s, 50’s or earlier! Today’s teenagers couldn’t think of much worse! Inserted a little bit of FUN in an otherwise one of the most boring (but necessary) parts of music education. 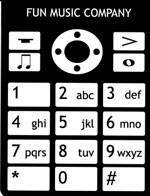 Musical Terms for the Digital age uses one of the current generations favorite toys… the mobile phone keypad. These days students talk about “Texting” their friends… meaning the short messaging services that are used on mobile phones. 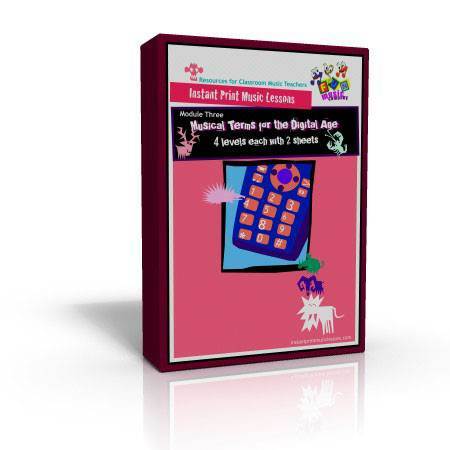 To do this they key using the numeric keypad with the number 2 representing A, B, C, the number 3 representing D,E,F etc. And you’ll be able to work out that LARGO means BROADLY. 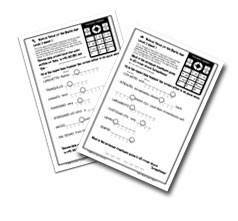 The students don’t need a mobile phone to do them of course… because we supply one on the top of each worksheet. Once you get the hang of it.. these are easy and Fun to do… and Kids LOVE doing them! 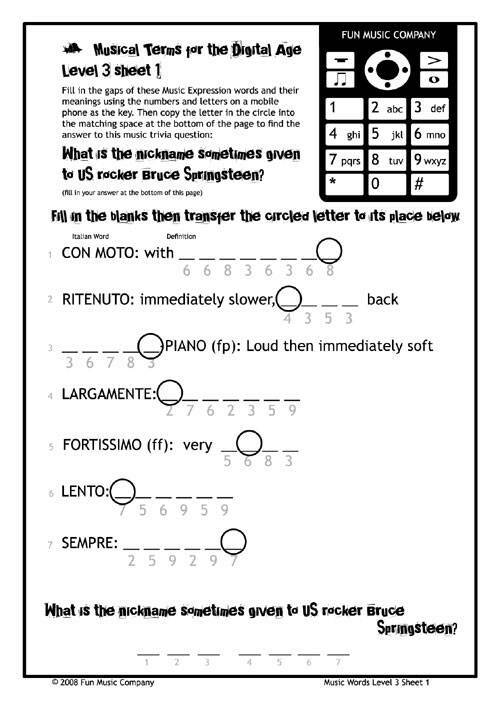 Of course like all the other modules in Music Theory Fun Sheets there is a little bit of trivia which ties it all together and gives the entire worksheet a bit of a challenge. 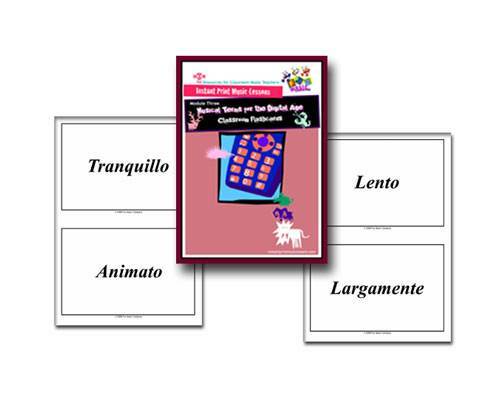 Musical Terms for the Digital Age contains four sets of two worksheets – eight worksheets in total… and for this reason is priced at just $9.95 for a lifetime use license for a single teacher. 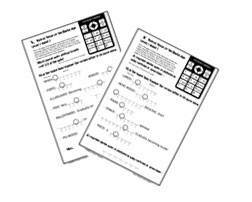 We have not created them to specifically match the syllabus of any particular exam system, however what we tried to do was make the four levels similar in standard to each of the standard examination systems (ABRSM, trinity etc). Therefore you’ll find that Level one roughly matches the terms that are in Grade One of the theory syllabi. Unfortunately due to the large amount of variation we couldn’t make them all absolutely matched to Grade Levels. OK – We don’t include everything.. however like all of Music Theory Fun Sheets we are not attempting to provide the only worksheets that you’ll use.. Music Theory Fun Sheets support the learning of these musical terms in your music lessons, whether you are a private music teacher preparing students for theory exams, or a classroom music teacher helping classes of students get their understanding of music theory together. This set of 44printable flash cards (22 pages) contains all the terms included in Module Three (Musical Symbol Code Breakers) of Music Theory Fun Sheets. It starts with simple ones such as Andante and Allegro, and moves through to more advanced ones such as Pesante, Perdendosi and Con Moto. 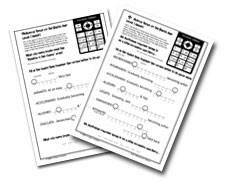 To create just one of these worksheets would take you at least two hours, so you can look at it that even if you just use one or two of them you are saving yourself many hours work in lesson preparation!